Barney Barnwell is Passin’ It On! Life is so busy that you barely have time for a yoga class let alone time to get to know your neighbors, right? Sure you wave as you drive past, buy Girl Scout cookies from their daughter, pass out Halloween candy to their lil’ goblins and all those other ‘neighborly’ things, but you can never remember if he goes by Charles or Charlie and you’re too embarrassed to ask again. Lucky for me, I had the opportunity to spend some time with one of my neighbors in the most unlikely of places—the Joint Replacement Pre-Op Center at Mt. Vernon Hospital. I was anxious as I reported in to the Center back in August, but relieved to see a friendly, familiar face—the face of my neighbor, Barney, who was manning the desk as a volunteer and checked me in. During the couple of hours I spent being guided through all the exam checkpoints, Barney left an indelible impression. I learned a little about his time in the military, his commitment to his volunteer work, and his passion for serving. Here’s what first hooked me about Barney—at 82 years young, he still gets up at 4:00 AM every morning and starts his day with at least a five-mile run. But what really struck me about Barney is that he not only had all the very anxious patients in the waiting room talking and laughing, he had them talking and engaging with each other. His bright, joyful mood was contagious. When I left that morning, I couldn’t stop thinking about Barney and the positive impact he was making on people’s lives every day. Barney was born in Charleston, SC and was just five years old when his father passed away. It was an event that would shape Barney’s life in ways he would never dream. With no dad at home, Barney became the man of the house and started working when he was in the ninth grade to help support his mom and little sister. Barney worked the 7:00 PM to 7:00 AM shift at Roper’s Hospital. The doctors and nurses there knew he was in school so they helped him with his homework and made a place for him to sleep in a closet so he would be rested. Barney never forgot their kindness and support. There were very few scholarships to be had when Barney graduated, but he knew two things: 1) He needed to go to college and 2) he would have to pay for it. His plan was to go to college for a year and then work for a year and so on until he finished. It was an eight year plan, but he was willing to do what he needed to do. That first year at South Carolina State College, he noticed an ad for a job in the cafeteria. With no dad around, Barney had learned to cook quite well so he applied. That job enabled him to go to school and work at the same time thus cutting his college plan down to four years. It was in college that he met his wife, Jimmi. She was a Chemistry major (not to mention a cute freshman), and he was a sophomore with a major in Biology. She came up to him one day and warned him to be careful or he was going to blow up the lab. “I knew she was just using that as an excuse to talk to me because I knew what I was doing in that lab,” said Barney. And that’s when the real chemistry took over. After graduation, Barney reported to Fort Campbell, KY to serve his three year commitment as as a second lieutenant in the Army. After his three years was up, his plan was to return to South Carolina to teach. Once he was back and realized that he could make more in the military, he returned to Ft. Campbell as a field artillery officer. Barney’s military career took him all over the world, including a one year deployment in Korea and one and a half years in Vietnam. After Vietnam, he taught at the artillery school in Ft. Sill before heading off to Germany to serve as commander of a target acquisition company. His wife and three young sons loved Germany and didn’t mind when he was asked to return for a second time—this time to Heidelberg in a position he refers to as the ‘kiss of death.’ “I was the one who was in charge of inspecting all the nuclear weapons within NATO to make sure they were doing the right thing. If they failed inspection, the person in charge could kiss their chance of ever getting another promotion goodbye. They didn’t like to see me coming. I was the kiss of death.” After his stint in Germany was up, he and the family returned to the States where he taught at the Armed Forces Staff College before taking an intelligence position at the Pentagon. Barney can’t talk much about his last duty prior to retirement other than he was one of three colonels responsible for the top secret place that POTUS would retreat to in the event of a nuclear attack. Not one to rest on his laurels, he retired from Lockheed on a Friday and started his volunteer job at Mt. Vernon Hospital the following Monday. 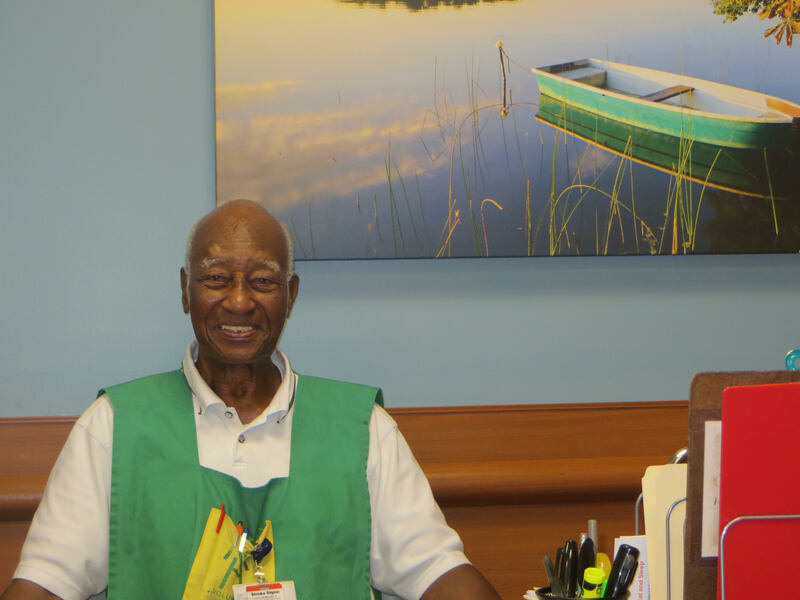 “I told myself many years ago that if I lived long enough to retire, I was going to give back in some way to those doctors and nurses that helped me when I was a boy.” It’s been 16 years since Barney reported for duty at the hospital, and he is still going strong. When he isn’t running his desk at Mt. Vernon, you can catch him volunteering at the Gum Springs Community Center or teaching Sunday school at Ft. Belvoir which he has done every week for the past 38 years, by the way. Thank you, Barney. In the short time I’ve spent with you, you’ve changed my life in ways I could have never imagined, and I can’t wait to pass it on! Let the season of giving begin! Happy Thanksgiving, everyone!